Bringin' it anew in 2010. Indie folk with The Albuquerque Boys Choir, Trevor Giuliani, and Leonard Mynx at Valentine's, 9 PM. 21 and over. Indie americana with Amy Bleu at Twilight Cafe, 9 PM. 21 and over. 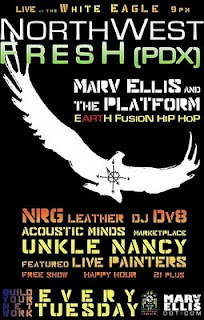 Northwest Fresh hip hop fusion with Marv Ellis and his live band The Platform along with guest rappers, DJs, live painting, and more at McMenamins White Eagle Saloon, 9 PM. 21 and over. Open Mic & Artist Showcase in the lounge at the Hawthorne Theatre, 8 PM. 21 and over. Creepy, murder rock from the Wayne Gacy Trio, indie-electro with Hello Morning, and "American" music from Rob Stroup & The Blame at the Doug Fir, 9 PM. 21 and over. Reggae Night at Mt. Tabor Theater, 8 PM. 21 and over. Someday Lounge presents The Fix with DJs Ohmega Watts, Lifesavas' Rev. Shines, DJ Kez, and DJ Dundiggy, 9 PM. 21 and over. DJ BJ and Nate C host Let's Go Crazy (80's Dance Night) at Berbati's Pan, 9:30 PM. 21 and over. Say-lem rap from Mob Royalle at Music Millennium, 6 PM. All ages. Acoustic rock from Steve Franssen and strumming from Joshua Du Chene in the lounge at the Hawthorne Theatre, 8 PM. 21 and over. Dance baby at Sonic Refuge Electronic Party at Mt. Tabor Theater, 9 PM. 21 and over. Folky stylings from Brain Bailey and friends in the lounge at the Hawthorne Theatre, 8 PM. 21 and over. Freak Mountain Ramblers jam at the LaurelThirst Public House at 6 PM. Followed by folk from Billy Kennedy with Tim Acott at 9:30 PM. 21 and over. It is my mission to provide a comprehensive listing of free, local performances in Portland. Please help this compilation grow by contributing your favorite free shows and by spreading this list around. For more free shows check out the Portland Concert Co-Op.